We are excited to release our new Quick Quote feature of our website! This tool enables you to draw your fence using Google Maps and will immediately give you the cost of your fence project. It’s a way to get instant fence quotes. To check out this feature, click here to get your instant fence quote. We are open to feedback, so please contact us with comments or questions. The biggest question people want to know when they are thinking about a fence for their yard is, “How much will this cost?” Pricing a fence can be a tricky process because of all the extras required like posts, caps, and gates. Our Quick Quote feature is designed to make this easy. By simply drawing out your fence project and selecting your desired style of fence, you will immediately get a good estimate of your cost in the form of an instant quote. While this software has been tested extensively, there still may be a few quirks so we encourage you to provide us with feedback on your experience. To use our Quick Quote feature, you simply type in your address. 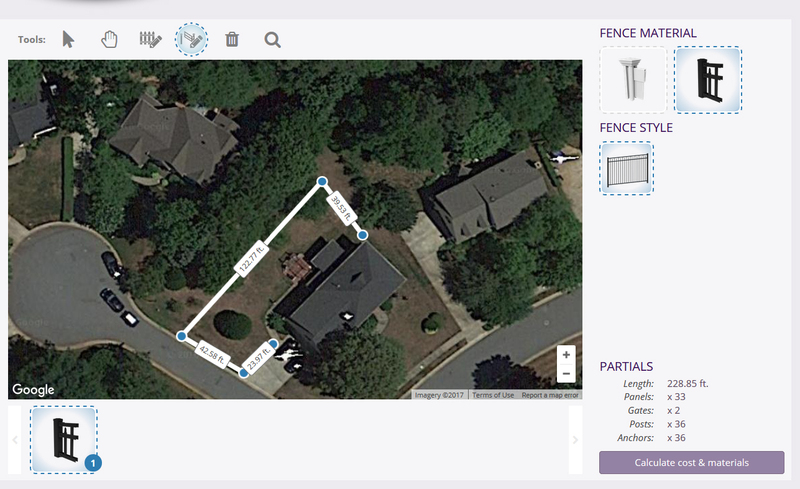 Using a Google Maps API, you will be able to draw your desired fence lines on your property and add gates. If you mess up and want to restart, you can easily delete your existing fence run and start over. You can play around with multiple styles of fence and choose different kinds of fence styles and materials. Once you are satisfied, you click to finish and you’ll get a price for the fence you selected. Get an instant fence quote has never been easier with our software. Go ahead- give it a try!